Born in the tiny town of Norway, Michigan, Art Van Damme was not expected to become a serious American Jazz musician. Classically trained as a pianist and motivated to become a professional musician, Art was a performing musician by age nine in a local theatre in upper Michigan. His family moved to Chicago when he was fourteen years old where he became a performer on the Santa Fe Railroad between Chicago and California. By the time he was eighteen years old, he had a Swing band, with Art on accordion, along with a bassist and a guitarist. Art Van Damme had a vision that the accordion should be a major instrument in Jazz music, and made it his mission to try to accomplish it in his lifetime. By the time he was twenty-one, influenced by Benny Goodman, Art was a band leader during a time when the Big Band concept was thriving. As a youth, Art was inspired by Benny Goodman and would study Goodman’s solos on clarinet and meticulously try to duplicate them on accordion. So, it was not surprising that, throughout his career, the style of Art Van Damme was often compared to the style of Benny Goodman, even though their instruments of choice were very different. Versatile, technically brilliant,charming and confident, Art Van Damme was cut of the same material as any of the prominent musical talents lionized in the 1940’s. However,in the midst of his success, he made a bold decision to leave the Big Band format and to become, first, a solo accordion act, then adding vibes, bass and a few years later, drums. By becoming a small ensemble performer, Art began to try to fit his music into a niche market, away from the Big Band venues, focusing on more intimate settings such as small supper clubs and restaurants and marketing studio recordings of his work. This was a very smart move during a time when musical styles were responding to emerging tastes and lifestyle changes of Post War America. The Big Band Era was over as suddenly as it had begun. For twenty years and after, Art performed and recorded consistently. He was a recognized part of the Jazz mainstream, touring and playing his brand of a softer, more subdued style of Jazz than had been previously popular. Art also worked as a session musician, but was constantly booked as a live performer, and toured extensively with his quintet. He traveled to Europe some 40 times or more and appeared on television and radio programs numerous times, in the States and abroad. 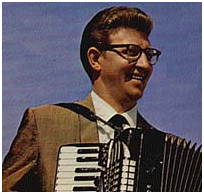 When interest in the accordion began to mysteriously wane, around 1960 , and hoping to help counter act this trend, Art Van Damme opened a music store and an accordion studio in Chicago, while he continued to tour and record, mainly in Europe. 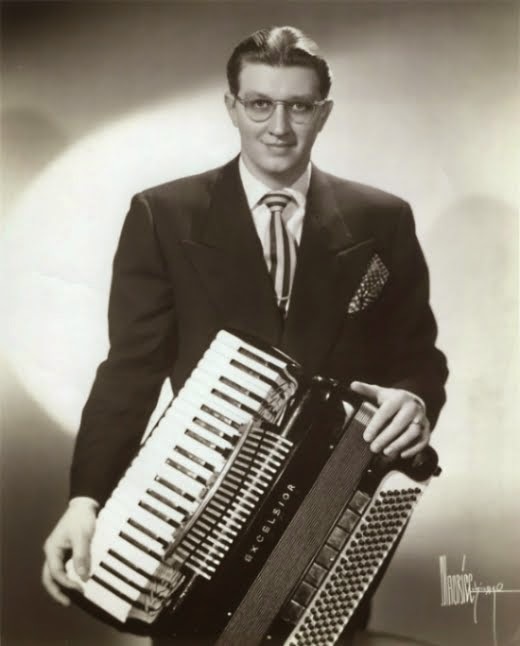 Unbelievably, the accordion in America, almost overnight, went from being an enormously popular instrument to fading, fast, from the American musical landscape. While Art had been astute at finding the pulse of changing musical tastes of America, he and other musicians unfortunately, had become victims of it. Art continued to record and perform until as late as 2008. Today, Art Van Damme is critically acclaimed as the best Jazz Accordionist America has ever produced and was a genuine breakthrough artist for the instrument. Art passed away, peacefully, in 2010 in his adopted state of California.